Two years ago in the final week of September, Michigan students marched on campus to the university president's house in protest of David Brandon and his department's handling of the Shane Morris concussion injury against Minnesota. The protest was officially about the concussion, but underneath the surface was a litany of grievances, most of which was simply just how far the Michigan program had fallen on his watch. Michigan was facing it's second failed head coach in a row, mounting losses to their biggest rivals...with some rivals taking their ball and going home...and a program that was seemingly headed for ruin. Fast forward two years, and the 4th-ranked Wolverines just beat the surprisingly 8th-ranked Wisconsin Badgers 14-7 by playing tougher and more fundamentally sound brand of football. Man...how fast things can change. That game last Saturday was a hard football game. It was brutal to watch for Michigan or Wisconsin fans and it was glorious for everyone else who enjoys a pure defensive battle. You definitely got the sense that both teams left it all on the field in this early season league showdown. Not everything that happened on Saturday was by the book. But the good far outweighed the bad, and when it was time for Michigan to step up and make a play, they did just that. Wisconsin was every bit the number 8 team in the country. That defense is going to ruin teams in the west division over the next two months and I won't be surprised when it's the Badgers representing that division in Indianapolis in December. Michigan's win over Wisconsin was a 3 and a half hour tribute to defensive football. 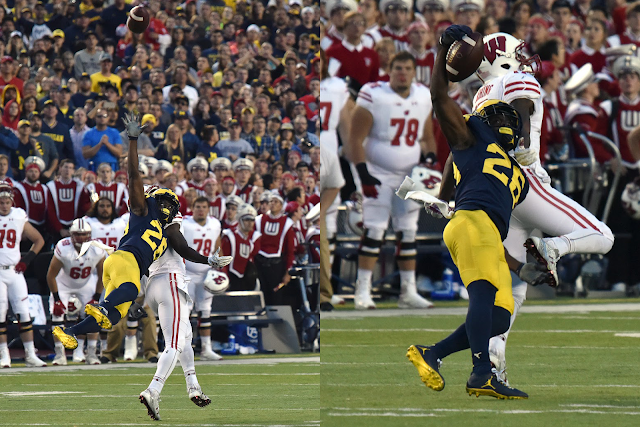 Aside from maybe two or three decent plays, Michigan shut the Badgers down completely. Without Speight's INT in the 3rd quarter, I don't think Wisconsin scores in this game. Say what you want about Wisconsin's victories over LSU and Michigan State, I still think those are pretty impressive wins for this Wisconsin team. And, I'd be remiss if I didn't mention Colorado sitting atop the Pac-12 south at 4-1 and 2-0 in the league. I think that win is just going to keep looking better and better as the year goes on. It also shouldn't go without saying, these Michigan men are playing their 3rd defensive system in 3 years. It's just hard to believe that under Don Brown, this defense should continue to improve as the season goes on. I think I speak for all of us when I say...yes please! 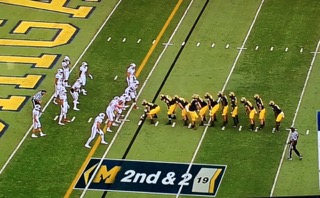 I mean, I could pick a single player or performance...but really in a game like this, Michigan won the battle up front. Despite only putting 14 points on the board, Michigan moved the ball pretty well considering Wisconsin's rushing defense was ranked 10th nationally giving up only 80.5 yards on the ground per game. Michigan was able to run for 130. The defensive line got a huge push play after play, and stifled any Wisconsin running game which ended the day with only 71 yards on the ground. Nothing Wisconsin wanted to do on the ground worked at all. Wisconsin was 4 of 15 on 3rd downs and only tallied 8 first downs the whole game. While Michigan's secondary had themselves a game as well, this game was won in the trenches. Ryan Glasgow led the way among defensive linemen. Chris Wormley, Mo Hurst and Matt Godin were all huge up the middle. No doubt this was Michigan's largest area of concern. Michigan had a few drives stall in the Wisconsin end of the field, and that's when getting at least 3 points is vital for not only the scoreboard, but momentum as well. Thankfully, Michigan won the game on offense and defense, and didn't have to rely so much on special teams this week to get the victory. Kenny Allen actually had a pretty good day punting the ball, averaging 46.6 yards per punt on 7 punts for the game...including 4 inside the Wisconsin 20. But it was the field goal kicking that hurt Michigan the most on Saturday. He and sophomore walk-on kicker Ryan Tice both looked a little rattled on their attempts. Word is freshman kicker Quinn Nordin is "working through something" according to Harbaugh in regards to an injury of some sort. It appears they'd like to redshirt him this season. Which means it's going to be up to Allen and Tice to figure out these kicking woes sooner rather than later. The senior led Michigan's receiving effort with 6 catches for 87 yards including his remarkable 46-yard touchdown catch midway through the 4th quarter that put Michigan ahead for good. Perhaps even more impressive was Darboh's 15-yard catch on 3rd and 9 on the play before which helped set up the go ahead score. I wasn't going to go with two defensive game balls, but Lewis' incredible interception was just too good. Despite the fact that he should've just dropped it since it was 4th down, we won't deduct too many points for that. Not to be outdone, Channing Stribling had quite the game himself. His two interceptions stand out on the scorecard but its the other things that make him a great corner. With Jourdan Lewis not getting a lot of looks by opposing quarterbacks and the recent injury to Jeremy Clark, a lot of responsibility has fallen onto the shoulders of the senior cornerback. He has responded impressively well. Ok, before you go crazy, let me explain. Like I said earlier, Allen had a pretty good day punting the ball. And since Peppers call fair catches all day long, it's Kenny's punts that were more impactful. There were at least a few times in the second half when Allen flipped the field. And given Michigan's penalty woes on the punt team, he had at least a few re-punts which ended up working out just as well. He needs to get his head right on field goals, but it's clear his strength is punting. This game was a defensive masterpiece and that's thanks to an impressive gameplan by Don Brown. Unlike Wisconsin which blitzed on every single play...Michigan stifled the Badgers with great run D/pass rush by the front 4 and a blanket pass coverage which held Hornibrook to only 9 of 25 and 88 yards...and 3 picks. OFFENSIVE CHAMPION – If you are going to be anything in life, be clutch. Why? Because clutch is king! I’ve played and coached in enough sporting events to realize that you are not going to steamroll every opponent you face. You are not going to ace every test you take. Eventually you will play some one, some team, some coach, who is just as good as you are. When that happens, you gotta be clutch. Why? Because, you will have to scratch and claw and fight for every point you get. Invariably the difference will come down to one key play and when that play presents itself to you, you gotta make a clutch throw, clutch move and clutch catch. Just like Wilton Speight and Amara Darboh did in the final minutes against Wisconsin. Clutch throw. Clutch catch. Clutch! Even if one thought Michigan might cover the 10 1/2 point spread, it was still going to be a rock fight. The reality is, advanced stats can help us understand what has happened, but it is still difficult to see when they tell us what will happen. We can see why Michigan's defense has been so good through things like its HAVOC rating and its stellar third-down completion percentage, but it does not mean that those things will happen again, just that they are likely to be as such, at least based on past performance. On Wisconsin's last-gasp fourth-and-ten, Lewis made an interception that ranks up there with Charles Woodson's against Michigan State. Yes, that one. Running full speed in man coverage against George Rushing, Lewis appeared to leap far too early on a deep shot down the middle. He hung in the air, kept his eyes on the ball, and plucked it backhanded out of the air, somehow pinning it against his body to keep it off the turf.